This walk follows the route of the old railway line from Barnstaple to Bideford, making it a flat walk. The South West Coast Path and Tarka Trail are both the same path along this part of the coast, and the walk starts with good views of the river Taw. 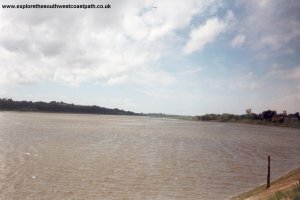 As you reach Instow, the river Taw and Torridge meet, flowing out to see. Rounding the corner from Instow, there are views over to Northam, before passing under the A39 into Bideford. Barnstaple is easily reached from the A361 that joins the M5 at junction 27 (near Tiverton) and the A377 from Exeter. Car parking is a little limited in the town centre. However, the coast path to Bideford starts on the north side of the river near the station. There is a small car park at the station and there is an out of town shopping centre nearby with a large car park, but check if there are any restrictions on how long you can park there. Barnstaple is easy to reach by public transport. There is a station at Barnstaple, the north end of the Tarka line that runs from Exeter, from where there are long distance trains to Cornwall, Plymouth, London, the Midlands and the North. There are local buses from Bideford, Westward Ho!, Appledore, South Molton, Dulverton, Taunton, Bratton Flemming, Lynton, Braunton, Woolacombe, Ilfracombe, Combe Martin, Croyde, Clovelly, Torrington, Hatherleigh, Crediton, Exeter, Hartland, Minehead, Okehampton, Tavistock, Plymouth and Tiverton. There are too many timetables to list here, but the link below provides further information. There is a good range of accommodation in both Bideford and Barnstaple. There are tourist information centres in both Barnstaple and Bideford, both have lists of all the accommodation in the area. There is also a good range of self catering accommodation around Northam and Westward Ho!, a short distance away from Bideford. For more information call Barnstaple Tourist Information Centre on 01271 375000 or Bideford Tourist information centre on 01237 477676, or see the links below. Barnstaple Tourist Information, with accommodation lists. The walk starts from the station at Barnstaple. The station is over the other side of the river from the town. Cross the river, then the station is signed, but go straight on past the shops on the left and then the station is at the end of the road. The path is well signed and starts at the end of the station car park. As you will probably have guessed, this path follows the route of the old railway line from Barnstaple to Bideford, which was closed in 1982, and removed in 1985. Being an old railway line it is flat and so easy to walk on. 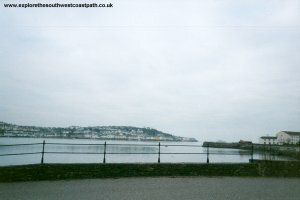 The path is also part of the Tarka Trail, a popular cycle route, so it can get busy, especially in the summer. As you leave Barnstaple, the coast path runs close to the river edge, giving good views over to Barnstaple and of the wildlife in the estuary. As you approach Fremington, there is a path out to Penhill Point. The path heads in land a little after Fremington, but rejoins the river at Yelland. From here, there is a choice of path, with a more coastal path for a short while, or you can stick with the old railway line. Both paths join as you come into Instow. From here there are views out to sea, before the path goes south into Bideford. The old station still exists in Instow, and the path goes through it. The signal box has been preserved here and is open on Sunday afternoons to visitors. 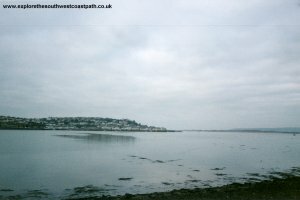 There is a good beach at Instow and views over to Appledore on the other side of the river. A ferry runs to Appledore in the summer. The path sticks to the edge of the river Torridge into Bideford. 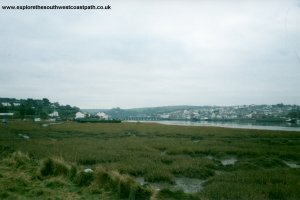 The working shipyard can be seen across the river, just to the south of Appledore. The town of Northam appears shortly after Appledore and the road bridge of the A39 passes high above near here. It is then a short walk into the port of Bideford. The coast path ends at the site of Bideford station. An old railway carriage now occupies the station and is open as a visitors centre and cafe. There is also a museum here and the Bideford and Instow Railway run rides in a break van over the 350 yards of track which has been restored. The Tarka Trail continues on towards Torrington, but the coast path crosses the river into Bideford. The bridge over the river is unusual in that all the arches are of different widths. This was because the arches were built to represent local parishes. The more money contributed by the parish, the larger the arch. If you're returning to Barnstaple, buses leave regularly from the Quay across the river from the old station. Buses run frequently (at least every 15 minutes), for most of the day (hourly on Sundays) on a variety of routes. The most frequent services are numbers 1 and 2, both operated by First Red Bus. Other buses also run on different routes less frequently. For more information on these services see the link below, or call 01271 376524. Here are some photos of the walk. Unfortunately, the weather was not especially good on the day I did the walk, so the pictures are a little grey. Click each picture for a larger version and description. Ordnance Survey Landranger map 180 covers this area of the coast path and is available from most book shops nationwide. It is also stocked at the Barnstaple and Bideford Tourist Information Centres. 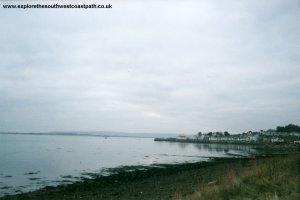 Multimap is a web site which provides maps of the UK, including around Barnstaple, Instow and Bideford. The links below will be of most use to the coast path from Barnstaple to Bideford. These maps join to provide the complete coast path between the two points.